As usual WEPLAYMUSIC returns to its eastern bloc(k) locale the Russian Bar for another instalment of classic Italo, warm house and brooding techno. Over the past two years WEPLAYMUSIC have distinguished themselves amongst the myriad of east London club nights as a must for all things disco, house and techno. And of course its free. No strangers to good music and big names, the WPM boys have played alongside to the likes of Terry Francis, Lee Curtiss (Wolf & Lamb) and Roland M Dill (Trapez) as well as featuring exclusive mixes from Turbo Recordings jock Matt Walsh, Compost’s Jay Shepheard and Traum Schallplattens Max Cooper. 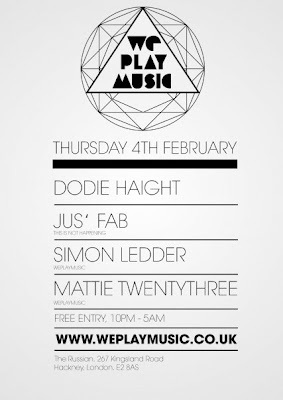 This months WPM introduces 'Dodie Haight' and This is Not Happening's 'Jus Fab' alongside WPM residents Simon Ledder & Italo obsessive Mattie Twentythree. Also checkout WEPLAYMUSIC's latest exclusive mix by Namito most famously known for his DJing days at Berlins legendary Tresor and E - Werk nightclubs.